A number of Organisations utilise the Nursing CPD Institute to assist their staff in meeting their Continuing Professional Development Annual Registration requirement. They do this, not only to value add to their Registered Nursing staff, but to also be sure that the care provided to their clients is based on current best practice guidelines. These Organisations have extended their use of the Nursing CPD Institute's platform to create their own education portal for their staff and have tailored additional education sessions to reflect the unique knowledge requirements of their service. The reason they have chosen the Nursing CPD Institute is that our education portal provides one of the most dynamic and cost effective Nursing online education options available in Australia today. For a small annual fee, you can have your education covered. Your annual fee gives you access to all standard CPD sessions available on the site. The Nursing CPD Institute is an established education portal that provides over 400+ Continuing Professional Development sessions for Nurses. It was established in 2011 and has evolved to become one of the largest online Nurse education portals in Australia. It was created by and continues to be staffed by specialist Nurse educators, who continue to work within the tertiary and health industry sectors. Customer feedback confirms that Nurses find the portal simple, effective and easy to use whilst the education sessions reflect current best practice legislation and clinical guidelines. The portal can be accessed via computer or smart device. The simplicity ensures ease of access and ongoing utilisation by staff. Organisational subscription includes the capacity to create education sessions specific to your service's individual requirements that only your staff have access to. There is the capacity to house your Organisations orientation presentation/s on this platform so that the services can focus on site induction and competency assessment. The platform is not limited by geography –if the site has the internet they have the same access to education irrespective of where they are located in Australia, or indeed overseas. There are no time constraints –it is available 24 hours a day –7 days a week irrespective of the shift the staff member is rostered. Staff can access the sessions in the work area so the requirement to backfill staff who traditionally would have gone to a designated training location can be negated. It is not limited by the availability, skill and/or knowledge base of the Service Educator, the portal provides staff access to over 250 educators. The portal creates a certificate for each session completed therefore your administration staff do not need to spend time creating certificates and filing same. Your contracted service providers can create sessions on the use of their product for staff to access at any time, so knowledge is not limited by the availability of the Company Rep to physically travel and provide a session at every service. There is the capacity to monitor the activities of staff on the system via the education matrix. The site is maintained and administered by the Nursing CPD Institute so there are no ongoing costs to the Organisation for specialised staff. What does Membership provide your staff? Over 400 one hour CPD sessions covering a large variety of Nursing topics included as part of the annual membership fee. A certificate for each CPD session completed –the staff member has an immediate electronic copy for their records. Should they leave the Organisation a copy is also retained on the platform for access by the Organisation's platform administrator. Capacity to access the site from anywhere on a computer or mobile device. Access to education that is not limited by geography, time of day, the shift staff are rostered, or the availability of the Organisation’s Educator. Best practice clinical updates to ensure that their practice is always up to date. Each staff member has a unique login as their identifier so their education activity can be monitored for compliance with Organisation requirements. An Electronic Evidence Portfolio to house their certificates of completion should the be audited. The opportunity to engage and Network with Nursing colleagues. Our affiliation with Australian College of Nursing provides your staff the opportunity to grow their career and tap into their individual potential. The Directors of the Nursing CPD Institute have created an education platform based on their experience as Health Care Managers, balancing the need for staff education and the budget available for same. They are also qualified and highly skilled Nurse educators researching the most effective way to provide Nurses with the education they require in an easy to access platform at a time that suits their needs. We would welcome the opportunity to take you through a tour of the site via an online teleconference at a time that suits you. We promise it won't take more than 10 minutes of your time. The online platform provides the opportunity to centralise the Organisations education program via a single portal which allows staff access across multiple sites and geographical locations 24/7. 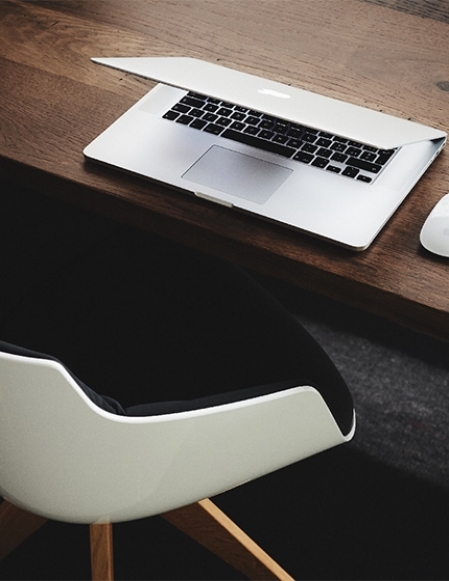 Online CPD is far more cost effective than traditional CPD education in a classroom. Employees can undertake their CPD at any time during their shift and can even pause a session and return to it later. This flexibility supports employees utilising the platform at any time; it reduces the requirement to back fill staff, negates the costs and time associated with employees having to travel to attend specific education, and removes the need for specialist education personnel to coordinate the activity. In-house education staff can focus on targeted policy and procedure driven education to meet specific organisational activities. This versatile education platform can assist with your Organisations Orientation Program. 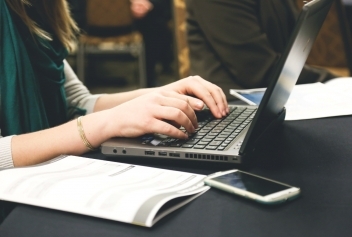 Rather than delivering the same lecture each time new members of staff are orientated, the Organisation’s orientation content, including key policies, can be incorporated into a webinar and/or quiz format which new employees can access. This can be extended to other sessions that you wish to roll out across the Organisation. It guarantees consistency with content and delivery which can be difficult to achieve with different personalities creating, interpreting, and delivering sessions. With an Organisation subscription, each service can nominate one or more staff to become the Service Administrator. The Administrator can add and delete staff to the subscription, utilise the inbuilt Education Matrix to monitor staff activity, and download and print attendance certificates and reports as they choose; there is no need to wait for a third party as your nominated staff have control. There is the capacity for you to create a Learning Plan for your staff to complete and monitor their compliance. There are 13 categories of CPD that have been created based on Nurse and organisational feedback. 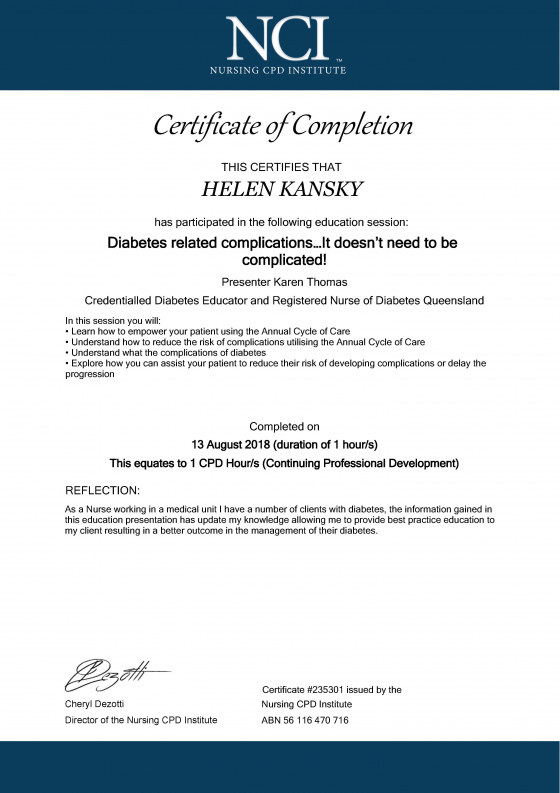 These include, but are not exclusive to Aged Care, Diabetes, Palliative Care, Infection Control, Law, Mental Health & Psychology, General Nursing, Wound Care, Professional Fundamentals, Pharmacology and Drug Calculations. The Education Matrix is a very useful tool to provide concurrent evidence for accreditation purposes or to assist with Human Resource Management. The Education Matrix allows the Administrator to monitor an individual staff member, a group of staff, or the entire workforce and the sessions that are being completed for a specified date range via an automated process. Should there be an unannounced accreditation visit, there is no concern that the records are not up to date. The Administrator/ nominated ‘super-users’ can view the Matrix at any time and can see at a glance what activities have been completed by an individual or group of staff by date or by topic. The Administrator / nominated super-users can also add other education sessions that have been provided at the site (outside of the Nursing CPD Institutes framework) so that all education activity is housed online in one automatically updated document. The Education Matrix can be filtered by individual employee, session and date range with reports able to be exported and printed. The Administrator can create an organisation wide learning plan from the sessions available and monitor staff completion of same. Your employees will have 24/7 access to over 400 CPD sessions. The content is geared towards the practical application by Nurses in the Workplace. New sessions are being added each month. All content is provided by key organisations/ experts in their chosen field from around Australia and the content is monitored so you can be confident that your employees are receiving concurrent and Best Practice information. 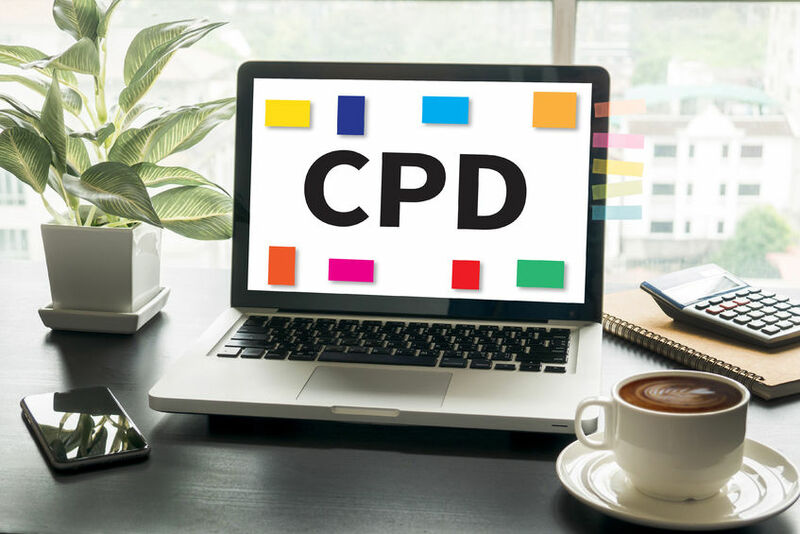 To support the principles of adult learning the CPD sessions are provided in a variety of different ways including Live Webinars, Webinar Recordings, Read + Quiz and Video + Quiz. There is also an online Video library of short Nursing Task Videos’. 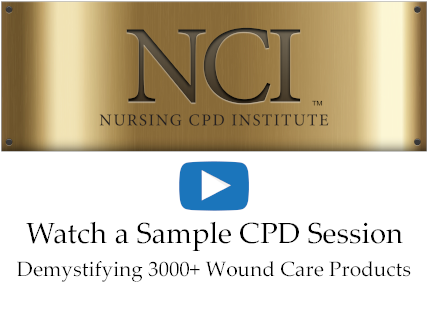 CPD Webinars and Webinar Recordings are an hour duration as are the majority of Quizzes. Annual competency education sessions are now available and we are continuing to add to the library. The viewing of sessions are timed and employees are unable to obtain the auto generated CPD session certificate until they have completed their reflection / correctly answered the quiz questions. "Absolutely brilliant information content. All information relevant and useful. Thank you. I will use this information in everyday life and at work"
Whilst the Institute was established to meet the requirements of Nurses registered with AHPRA a number of the education sessions are applicable to Care Staff and more sessions could be created for Care Staff using the customised CPD offer. Part of the organisational subscription is the ability to create specific CPD sessions to reflect your Organisation’s unique requirements. provide the specialist staff to host the webinar or create the quiz based on that content. You may choose to direct your suppliers to utilise this customised platform to create sessions to provide consistent and easily accessible sessions for your staff. The number of unique sessions available with the organisational subscription is based on the number of member subscriptions the Organisation requires. Would you like a 10-minute appointment? To support Nurses in the provision of evidence should they be audited by AHPRA, each employee has access to a Professional Portfolio on the website. This Portfolio is stored securely and the employee can add and alter information as they choose. The Portfolio upon completion is auto compiled into a PDF for ease of email/printing. The site is simple to use with help information contained on the site, however, should it be required support staff are available via email or telephone. You would also be allocated an organisational subscription Support Manager to personally assist with specific queries from the Site Administrator. NPAQ was launched in May 2014. We had identified the importance of relevant CPD learning tools for Nurses and were very pleased to have located the Nursing CPD Institute. Giving our members access to a platform which is available online 24/7 and maintains their CPD Training records is a real benefit. We appreciate the effort the Institute's team have put into the creation of the content and its ongoing development. Organisational pricing is based on the number of staff subscriptions required. Full membership of the Nursing CPD Institute for each of your nominated staff members. Maintenance of the Education Matrix to monitor staff activity and utilisation. The ability to create service specific education sessions that only your staff will have access to. Maintenance and upgrade of the website system. Continual creation of new best practice education sessions by webinar or online quiz. add and delete staff to the system, monitor staff completion of education activities, create learning plans for staff to follow, create an education matrix as evidence of what education sessions an individual staff member has completed over a specific date range or what all staff have completed over a specific date range, is able to reactivate deleted staff as required. 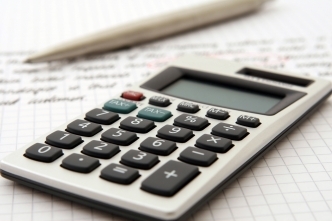 We offer straight forward annual pricing to meet the needs of the Organisations of every scale. 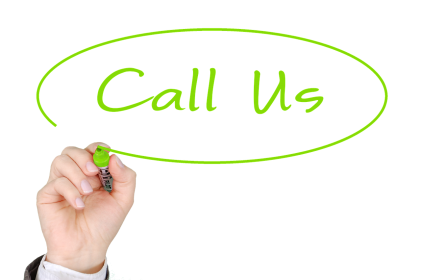 We guarantee to be the most cost effective option for your Organisations. NCI Corporate helps take the stress and excessive cost out of staff education. BOOK A 10 MINUTE APPOINTMENT TO START YOUR FREE TRIAL!